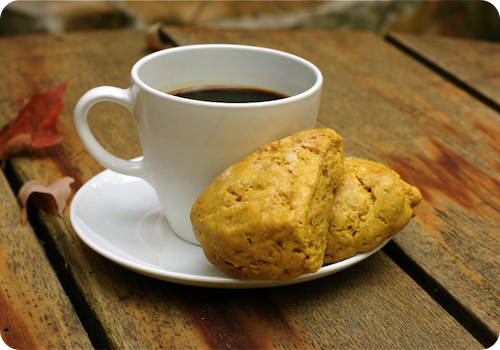 A warm nibble for the cooler days ahead; spiced pumpkin scones. Photos courtesy of Deep Media. “Don't you love New York in the fall? It makes me wanna buy school supplies. I would send you a bouquet of newly sharpened pencils ..."
Sometimes I think I would really like to go back to school. I could say that it was because I wanted to be surrounded by knowledge, or that I long for the daily exchange of ideas or that I crave an opportunity to stretch my mental boundaries. But, while all of that is well and good, I must be honest. The thing that would most excite me about back-to-school would most likely be the stationery. My love of lists is old news, I know. But it is a continuing, relentless habit. What you might not realize though is that the quirk is even deeper-rooted than the itemized collection of things to do; in fact, lists only scratch the surface of my fondness for writing things down, getting organized, and the supplies associated with both. The whir of a label maker makes me happy. I have spread sheets detailing gifts given for holidays over the last five years. I was recently miffed to find out that Ikea had discontinued the glass jars I like for pantry storage. I have been known to colour code paper clips to best suit the subject matter they clamp. Seriously. And yes, I got made fun of for that one. As you can well imagine, my level of commitment to eccentricity has led me down many an aisle of a stationery store. And so then you can imagine, I have bought enough stationery to be particular in my purchases. Rollerball, not ball point pens please. A mechanical pencil with no more than a 0.5 millimetre lead, thank you. But back to the lists. My incessant scribbles need a home, and this brings me to my greatest love of school supplies - notebooks. Oh, how I adore a brand-new notebook. Whether tiny or fat, simple in its decoration or elaborate, a notebook smacks of promise and new beginnings. Some notebooks seem to make ideas flow easier; inspiring one to sit down and put thoughts to paper. Throughout our house, our car and in my purse, you will find notebooks. Teeny tiny scratch pads for quick reminders are tucked in the junk drawer in the kitchen. On the desk is a thin, spiral bound notepad of my father's, containing a story about a squirrel I wrote in elementary school. A collection of journals line a shelf in the den, their contents spanning years of our lives. Innumerable recipes and food thoughts are jotted down on scraps of paper and tucked into random books and magazines, or take up books of their own. It was in one of these (many) notebooks that I came upon a recipe for Spiced Pumpkin Scones and, as a bonus, a mystery. Reading it over, I realized that I had absolutely no recognition of the words whatsoever. Though in my handwriting, with notes and substitutions in the margin, I have absolutely no remembrance of where the recipe came from, or when I heard of it. Mysterious provenance aside, I was charmed by prospect of lightly-spiced scones; perfect for the cooler weather forecast for the weekend. They were quick work through the use of a stand mixer. Butter is blended into dry ingredients, then liquids are added to that. Dump everything out onto a work surface, knead lightly, and you're done. All that is left is to cut the dough into the desired size and bake. A scant 15 minutes later a tray full of proudly-puffed scones are yours to be enjoyed. The addition of cake flour helps to keep them tender, while the pumpkin purée adds moisture and pleasing saffron yellowness. Lovely on their own, even better with a smear of butter and a cup of tea. Simply delicious. Wherever this recipe came from, I am so glad I had someplace to write it down. Russel + Hazel, See Jane Work, Etsy, and of course the classic, Moleskine. Spontaneous moments often end up overshadowing the most stylized effort. 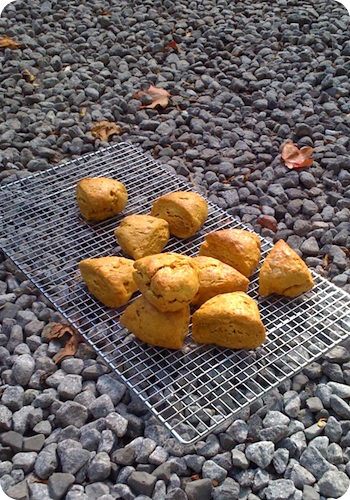 While enjoying these little bites outside, the cooling rack was momentarily placed amongst the stones. I was so taken by the texture of the crumbly, crackled scones against the gravel, I felt compelled to include the image here. Of unknown origin, but so tasty that I am tempted to claim them as my own. Turn the dough out onto a lightly floured surface. Working quickly, gently knead the dough, folding and pressing gently until fairly smooth. Divide the dough into four, and shape each ball of dough into a 4" round about 3/4"-1" thick. Cut each round into six wedges, and place on the prepared baking sheet. Once finished, brush each scone with the egg wash and sprinkle with granulated or sanding sugar. • 1 tablespoon of pumpkin pie spice can be substituted for the individual spices. • The scones can be frozen before baking. After cutting them out, place them on a parchment-lined baking sheet and freeze uncovered. Once firm to the touch, remove to an airtight container or a freezer bag and store. To bake, take the scones from the freezer and preheat the oven. Wait 10 extra minutes after your oven has reached temperature, then egg wash and sugar the scones. Bake for 15-18 minutes, until cooked through. • These can be made without the aid of a stand mixer. Use a pastry cutter or two knives to cut the butter into the flour, then stir in the wet ingredients. Do not over mix, stir until just blended. From here, the method remains the same. • If your kitchen is very warm, chill the cut scones for 15 minutes before baking for best results.